Welcome to Mobley Eye Care! Mobley Eye Care is looking forward to serving you and your family by providing the highest level of optometric eye care. Our goal is to provide modern and comprehensive optometric vision care and eye exams, offer a wide selection of glasses, designer frames, sunglasses, and contact lenses, and to serve all of the vision and eye care needs. We are dedicated to advancing the well being and comfort of all of our patients in a most professional and compassionate way. We recognize that our patients are unique individuals, and we custom tailor each eye exam to solve your specific vision problems using advanced optometric technology to ensure that the health of your eyes are maintained. We will work with you to make sure the eyeglasses and contact lenses prescribed meet all of your vision needs. We offer a full range of optometric services, including annual eye exams to check the health of the eye, eyeglasses and contact lens prescriptions, prescription sunglasses, red eye/pink eye exams, minor foreign body removal from the eye, dry eye and glaucoma evaluations and treatments, as well as cataract and LASIK surgery pre and post operative care. 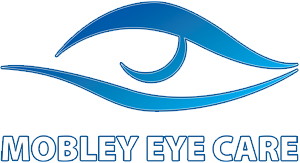 At Mobley Eye Care, we are dedicated to providing high-quality optometry services in a comfortable environment. Call us at 770-304-2025 or schedule an appointment today online. At Mobley Eye Care, we strive to provide the most thorough and comprehensive, primary eye care for the whole family. At Mobley Eye Care, we believe in continual improvement of our services. Visit our patient center for more information.